After seven weeks, the notorious and popular torrents site "The PiratesBay" is back again with its earlier .se domain. From the digital ashes once again, TPB is back online today. In earlier December, The Pirates Bay server was raided by the Swedish Police which makes TPB totally offline. Later on after two weeks, site domain once again back with the online waving a pirate flag on its temporary homepage. Later on TPB added a countdown for its back and was schedule for February 1st. But One day before it hit back the internet and now the site is live again . A few minutes ago the site started serving torrents to the masses again, much to the delight of millions of users. 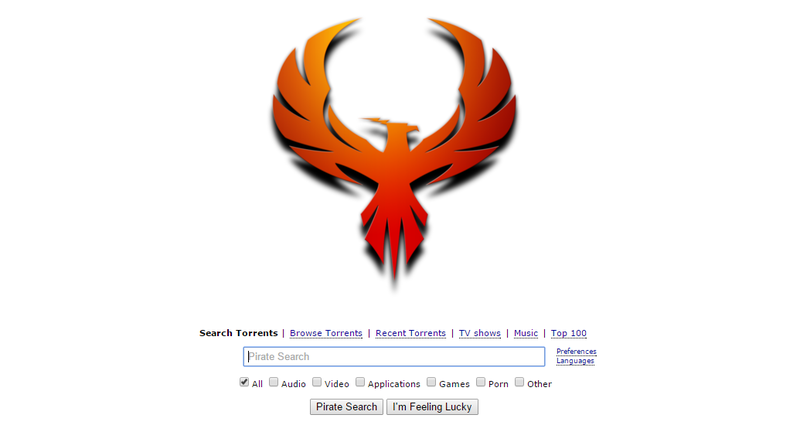 The Pirate Bay’s homepage currently features a Phoenix. There is no changes made over the design of the site expect a Phoenix image at homepage. All the users accounts are working fine and the “Contact Us,” “RSS” and “Register” links are not operational yet and result in a 404 error. It is just a minutes that the Site have got live and users have started sharing its torrents. Almost 5 pages of the site have already filled with the latest torrents share and that also with in 10 minutes of the launch. This shows how popular is the site. Earlier a source claim that, TPB will get the new look and fresh design as its admin says that the look was quite old and buggy. But this doesn't happen, or may it get re-design in coming future. There are tonnes of users who were upset with the downtime of TPB, but now its overs. Lets see what happens next.